American surf rock band formed in 1962. They are best known for two of their hit songs "Wipe Out" and "Surfer Joe". They eventually abandoned beach and hot-rod themes for folk rock and had a number two hit in Japan with the song "Kareen". Ron Wilson died from a brain aneurysm in May 1989. 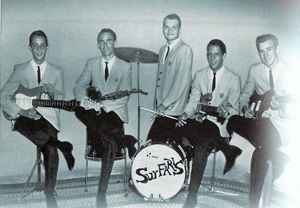 Bob Berryhill reformed the Surfaris in the 1990's with his wife Gene, a concert violinist, playing bass, their younger son Joel as the drummer and their eldest son Deven on guitar. They have released new material with this line up featuring surf rock done in a Christian style.